New York has a new must-do attraction. The observatory at Rockefeller Center has reopened as Top of the Rock. A great deal of thought went into the redesign, beginning with the process of purchasing tickets. Tickets can be reserved through the website TopOfTheRockNYC or by calling 877-NYC-ROCK (877-692-7625). There are also terminals onsite for ticket purchasing. The reserved-time tickets are expected to minimize long lines or large crowds. Once on the mezzanine, three plasma-screen monitors show rotating videos about Rockefeller Center including the events that are held, a day in the life of the Rockettes and the history of the Rockefeller family's famous construction narrated by David Rockefeller. The elevators, dubbed sky shuttles, have transparent glass ceilings which reveal the red and blue neon stripes in the elevator shaft pulsating a mini light show. The ceiling is also used as a projection surface for images of moments of history. Visitors will also notice the cut crystal installations designed by Swarovski. Radiance is a massive crystal geode-style wall on the observatory wall. 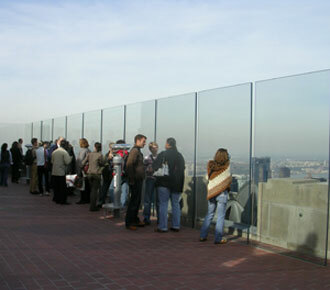 At 180 feet wide and 9 feet tall it consists of 600 custom-designed glass panels that simulate faceted crystals. Joie is a beautiful 35-foot waterfall chandelier made of 40,000 crystals. Created by German artist and designer Michael Hammers it echoes the outline of the building that is the heart of Rockefeller Center -- 30 Rock. The Mezzanine waiting area also holds an exhibition space with the original Basswood model of 30 Rockefeller Plaza, and a simulation of a building beam which visitors can walk along while looking down into a scene of the construction. The 70th floor crowns the building and offers views of NYC without the high clear safety- shield providing a visibility of approximately 80 miles on clear days. Most of the people enjoying the views were visitors. Some had come in the past and were noting the changes in the urban landscape. "We come back every 20 years," quipped a couple from France. And another couple from New Jersey were in for a 50th high school reunion and heard the observatory was open from a radio show. Others had just showed up and were surprised at their luck in finding the observatory decks were open. Rockefeller Center never lacked for visitors. 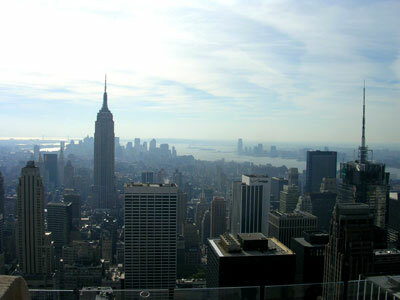 Now they have another reason to visit Top of the Rock.